Now that the hype from Comic-Con has returned to manageable levels, a teaser of the upcoming Avengers movie has been released online and reposted courtesy of Aint It Cool News, minus the Beatlemania-like shrieks that made footage of the teaser’s Comic-Con debut near-unwatchable. The shadow of the Avengers dominated this year’s Comic-Con, and the hype culminated in the official reveal of the cast and director. 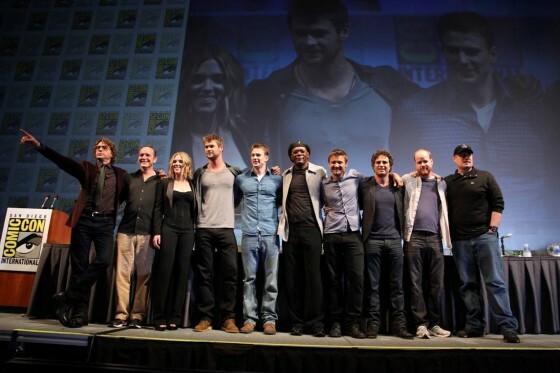 With the exception of Mark Ruffalo officially being announced as the Hulk, there weren’t any surprises in terms of the cast and crew (and even Ruffalo’s casting was very heavily rumored), but to see the future Avengers all on stage at one time made it real. The Avengers is not the first movie to attempt to incorporate several superheroes in one film. In 2007, Warner Bros., began to push for a Justice League movie based on the DC Comics superteam, and Australian director George Miller (Mad Max, Road Warrior) was signed to direct. The movie was to be called Justice League: Mortal, and would act as the first of a planned trilogy that would include Batman, Superman, Wonder Woman, Green Lantern, and the Flash. The production had the full support of the studio, but the 2007-2008 Writer’s Strike slowed the production. Time and a ballooning budget finally killed the project, and the movie is in development limbo. So the announcement, and teaser of The Avengers is a welcome relief to fans that still might harbor concerns- however unfounded- that it might not happen.